Virender Sehwag Ribs Parthiv Patel In Most Viru-esque Way. Seen It? Virender Sehwag really has his Twitter game totally on point. Former Indian opener Virender Sehwag's escapades on Twitter are now the stuff of legends. The Twitter King enthralls his followers with some of the most interesting, funny and retweet-worthy tweets. Whether it's his naughty birthday messages or his skillful take downs or simply his observations about day-to-day life presented as #ViruKaGyaan, the Nawab of Najafgarh has his Twitter game totally on point. Adding to his already long list of witty tweets, Viru just posted a hilarious joke that has many on the micro-blogging site in giggles. What's more, he couldn't stop himself from tagging cricketer Parthiv Patel in his little joke. 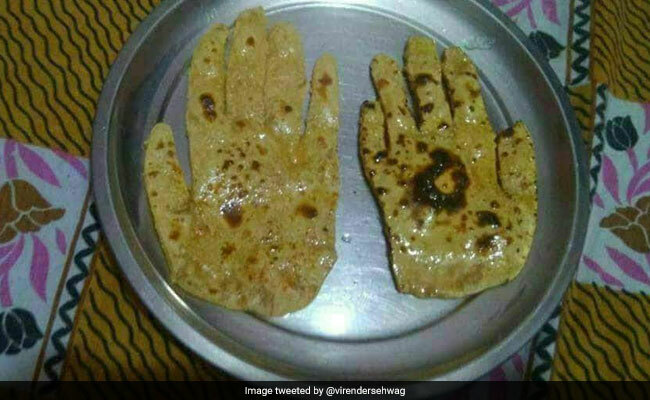 Posted on January 10, the tweet is a joke about a nai naveli dulhan and some rotis she's made for her husband. We don't want to mess it up for you, so why don't you just take a look at the tweet yourself. Sehwag's joke didn't just end there. He posted another tweet tagging Parthiv Patel, asking if he was looking for some wicket-keeping gloves. Twitter sure is loving the joke. The tweet has received over 24,000 'likes' and more than 2,500 retweets so far - and still very much counting. Tell us what you think about Virender Sehwag's joke using the comments section below.